You can also eat it straight out of the jar. Jennifer, looking at her phone while still in bed: There’s no way Trump is going to serve out his term. Mark: Well, you know what I think. Jennifer: Right, you think he’s going to serve his term and get re-elected. Mark: I think he’s going to serve all four years. Of course he is. He loves this stuff and what’s going to take him down? Jennifer: Nope. Something is going to happen and he is going to resign. It will be sudden and swift. Let’s make a bet! You agree to go with me to the orangutan sanctuary in Borneo someday if he leaves office before his term is up. If he makes it to the end, I agree to go on the driving trip around the Great Lakes. Mark: I’m not going to bet something that would make one of us unhappy. Jennifer: I wouldn’t mind going to the Great Lakes. Jennifer: You’d truly mind going to the orangutan sanctuary? Mark: You know I would. Jennifer: How about this: We get a dog if he leaves office, we don’t get a dog if makes it to the end. Mark: I’m not going to bet something that would ruin our lives. Jennifer: How about this: If he stays in office the full four years, we move to a townhouse without a yard or any animals. The conversation petered out at this point because I get bummed thinking about the townhouse. Our imminent move to a sterile townhouse when Owen leaves is an ongoing joke that I increasingly worry is not a joke. I went upstairs and pulled out the jar of Alton Brown’s overnight coconut oats that I mixed yesterday. I’ve been wanting to try this recipe since I first opened EveryDayCook back in December, but kept postponing because it looked incredibly fattening. I finally got tired of wondering what it tasted like. What did it taste like? Ambrosia. 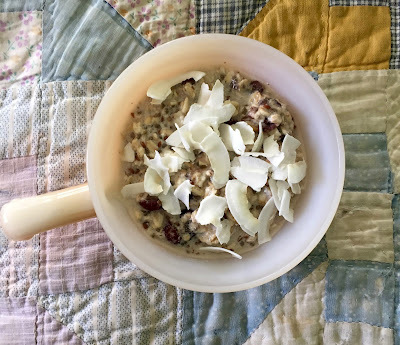 The internet is packed with recipes for oats-in-a-jar that look like this one, but I have never tried any of them so I can’t say if Brown’s version is better or worse, only that it’s delicious, a creamy melange of oats, chia seeds, flaxseed meal, and nut milk topped with with crunchy coconut flakes. I ate my oats slowly, as I would a pudding, savoring every exquisite bite. I will be making this again, probably within hours. I’ve made some adjustments to the recipe. Brown calls for 75 grams coconut milk and 75 grams almond milk — but he doesn’t specify the type of coconut milk. Does he mean the thick, rich coconut milk in a can? Or the thinner, lighter coconut milk you find in jugs in the refrigerator section of the supermarket? I went with the latter and used Califia Farms unsweetened, blended coconut and almond milk. But really, you could use any milk you want — soy, cashew, dairy. I also felt you could use less syrup and go easy on the dried fruit. I omitted cinnamon. You need a scale for this. Shake the milk, maple syrup and vanilla in a pint jar until well blended. Add everything but the coconut flakes and shake the jar again, very vigorously. Screw on the lid. Refrigerate overnight. Top with the coconut flakes. Serves one. I'm with you. Yes to both trips, yes to a dog. The oatmeal sounds lovely, too. Yes. I pine for a dog. We got a dog this spring, a PBGV, and we are delighted. Mark is right - it requires commitment of everybody in the household. When we first married, my husband was afraid of dogs (a bad experience with a German shepherd as a child), and I consider it a measure of my love that I married this guy thinking we might never have a dog. My one solace was that he might die first, and then I could have a dog. Yesterday while I was writing that post I didn't check Twitter -- and when I was finished and checked Twitter, more madness! Like Gretchen, I check in and WHAT? Two posts! Like a gift from the heavens. I don't know why you suddenly got the bug to post, but I am not questioning it. If it is the Donald, then I have found the one positive in his presidency! I don't lack imagination, I felt it would be this bad. I just lacked the specific imagination to know what kind of bad. As heart rending and disgusting as it is to say, I think Mark is probably right. He would *never* resign; it is not in his personality, I don't think. He won't get impeached, because the Republicans don't want to admit his election is a horrendous mistake for the country. They would rather treat him as the very eccentric uncle everyone tolerates. I certainly hope I am wrong on both scores, but if he gets re-elected, I truly may have to leave the country. I enjoyed your garden pictures, they are lovely. You should get out there more often. It is easier to effect change in the garden than in politics. I learned all about injera when I read Cutting for Stone, but I have never eaten it. I may just have to find an Ethiopian restaurant in this town, if that is possible. The Alton Brown recipe sounds very fattening. It also sounds delicious. If you decide to get a dog, just remember there will be no one to help you with it. I have two, and although I love them, they are a *lot* of work when you are the only one taking care of them. I have toyed with the idea of a townhouse, but I love my land and the privacy it gives me. I can't imagine living cheek and jowl with other people, especially these days! So maybe you can tell Mark, "ok, no dog, but no townhouse". I think that sounds like a perfect marital compromise! I like your compromise! He has said he will not do anything to help with the dog, so I am not getting one. I would have to hire someone to walk it if I was gone for a day, even if he was here. I sort of assumed that Trump would get some handlers who would manage him better than this -- I didn't predict the sheer incompetence. It's wild. It's terrible that I'm heartened to read these comments because it means everyone thinks we're going to be alive and have some sort of functioning country with elections and travel options in 4 years. I read the news when I was feeling hungry and tired. That used to be a neutral experience but now it's a soul shaking one. Ugh. Like the others mentioned, it's a special treat to read your posts. Thank you! I know where you're coming from -- sometimes it seems like the world might end. (Isabel is supposed to go study in Korea next year. Gulp.) I really do think Trump is going away, but as you see, there are many who disagree. I've been loving all the recent developments. Here's hoping the end is near. Yes -- bad news is good news. Bring it on. Wait, Mark doesn't want to go to an orangutan sanctuary? That sounds like a great trip to me, much better than driving around the Great Lakes which is a potential symphony in the sameness of water and trees. I knew Trump would be bad, it's the specific, sudden and chaotic nature of the badness that's really throwing me. Part of me wants it to go on so that the Democrats can at least make some gains in the midterm elections. I worry that if he's controlled somehow, people will get complacent ("see, he's adapting to the job after all!") and conveniently ignore all the reasons why his administration is so terrible for our country. The oats look good. Alton Brown is a rock of comfort in trying times. "it's the specific, sudden and chaotic nature of the badness that's really throwing me." Exactly. It's so unpredictable. Have you read the chemo therapy of Trump? That he is working like chemo, making us very, very sick before we can get better? Lord, I hope that's right and that it's almost over. I am dying to go to the orangutan sanctuary. No one will go with me. . . yet. I am working on Owen. Maybe one of his college summers. I imagine that there are plenty of people here who would want to go to an orangutan sanctuary with you. You would probably need a whole plane to carry us. Anyway, keep us in mind. Mark can stay home and take care of the new dog. I also got addicted to Twitter; in fact I used up just about all of my data checking it every time I had one second, maybe less, even when I wasn't home. You broke yours. This is a pretty difficult time to cold turkey it so I am just trying to act like a reasonable person in these unreasonable times. This does sound fattening - but delicious. Please keep writing. As you can see, a lot of us look to it as a bright spot in our day. We need all the bright spots we can get. I am back on Twitter! First thing in the morning, periodically all day. When this is over, if this is ever over, I feel it will be easy to quit. I have no interest in anything on Twitter but THIS. I've never been on Twitter and see absolutely no need. Everyone has already captured my thoughts but one--cinnamon and coconut are an alchemical combination. Try the recipe with the cinnamon. Ok! I will try it. Big pinch of cinnamon next time. Also dried wild blueberries are perfect in this. Go ahead and bet anything you want. I predict you will win. But getting a dog is a big deal, so I wouldn't do it just out of pique at DT. Hope everybody feels just slightly differently about their predictions with two more days under our belts! Am I the only one who also would never voluntarily go to an orangutan sanctuary? The guilt would be overwhelming. First, we ruin the planet and their environment, then we move them into a "sanctuary" to save them from ourselves, and now we subject them to a steady stream uninvited visitors. Of course, I don't really care for most animal/human encounters except for those involving household pets and farm animals so there's that. I just think we should leave the elephants, dolphins and sea turtles alone. Thanks for the great recent posts. So needed right now! Two posts in a week! This will be breakfast next week to replace the instant oatmeal smoothie from the Thug Kitchen site (raw oats, frozen banana, peanut butter, almond milk, dates, and cinnamon). I keep thinking I need to leave Twitter all together as it's too easy to get sucked in, but I keep hoping for more bad/good news. You should go to the orangutan sanctuary even if it's on your own. So glad to see you posting twice in a row! Also, I'm so confused over why everyone thinks this is fattening. The oats seem so healthy? All I want is a post about the food and of course, comments made during the upcoming foreign tour.....and does Mark have information about the future we need to know? Being healthy simple means eating healthy. So it's must to consume healthy meal always. For this your suggested recipe is really a must try and nutritious too. I would love to add to my weekend meal. I have a theory. That Ethiopian lady who ran the cooking class and the French teacher who taught David Sedaris to talk pretty one day are the same person. Or at least related. I'm all about ONO lately, too. I don't EAT them, not my porridge-y thing, but I love concocting them for my husband. He really likes 'em. My secret ingredient is loves of super slivered dates. I'm with her. You. No WAY four years. What's Mark smoking? Fitness comes only when we consume healthy. We all know that breakfast is the most important meal of the day and this recipe is really very easy to try at home. It's consumption during breakfast has magnificient body effects which makes it a must try recipe. I just can't even Go There with commenting on the whole Trump Situation.